The Equibooks Bookstore offers the most outstanding horse books about horses and breeds of Spanish ancestry. For the admirer and aficionado of Iberian horses, Andalusians, Lusitanos and Sorraias we recommend Lady Sylvia Loch's highly respected book. "The Bible of the Iberian Horse". This extraordinary book tells the story of the great war-horse of Spain and Portugal, th Andalusian and the Lusitano. The author's original research covers the development of horse and horsemanship in Iberia from pre-Roman times to the present day. Sylvia Loch also highlights the contribution which these noble stallions can make to the promotion of dressage. In the teaching of classical equitation these horses, with their magnanimous temperament, strength and extravagant action, are Nature's schoolmasters and now occupy a prominent place in the equestrian scheme of many countries, especially Germany, France, Austria and Australia, as well as Spain and Portugal. Expertly illustrated with 50 color and 75 black & white plates. With over 250 pages, this hardcover book also makes great reading for the admirer of today's Paso horses, giving an in-depth view of the origin of the Sout American horses, the Peruvian Paso, Paso Fino, Mangalarga and Criollo. The book includes a great number of source references on the subject of Iberian horses, from the Sorraia, Garrano and Asturian horse to the Jennet and Barb. The Royal Horse of Europe is not just a history of the Iberian breeds, it is a study of the way of life through centuries. 125 color and black & white illustrations. A selection of the fine illustrations from "The Royal Horse of Europe"
The riders of the Andalusian School of Equestrian Art at the opening ceremony of Alvaro Domec's last fight. Photo by the author. 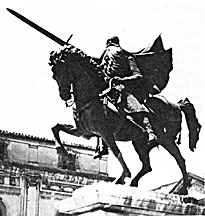 El Cid, reigns supreme on his Andalusian charger Babieca over the ancient city of Burgos. Horseman on the plains of Spain. Photo by Ward Wallace.